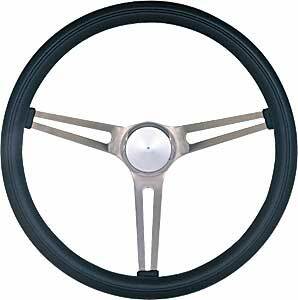 Inspired by the muscle cars of the '60s, Grant Classic Series Nostalgia Steering Wheels replicate the original equipment or popular aftermarket designs to give your restoration, hot rod or restomod a period correct look and feel. 3 chrome or brushed stainless steel spokes. 969-0 is rated 4.7 out of 5 by 3. Rated 5 out of 5 by Doc Wade from Steering Wheel Very satisfied. Exactly what I expected. Fast delivery. Rated 5 out of 5 by farkle from It fits good and looks good!!!! I like this product. *470-926 is shown without the Chevy horn button. Click the link in the description for close-up image.